7 July 2014 - thank you for looking. We do not charge for dogs, but pls clean up behind your animal and keep on a lead at all times. This is due to our free range chickens and peacock. A payment of 50% is taken at time of booking. The remainder to be paid on arrival at Moorhouse Campsite. Refund Policy - a full refund will be given up to 2 weeks notice of the holiday date. Thereafter a 20% booking fee will be held from the cost of the full amount of stay. This will be taken from the deposit held. Please phone us to book your pitch. Payments can be made over the phone by debit card, credit cards will incur a fee of £2 per transaction. Cheque made payable to Moorhouse Campsite. PLEASE IGNORE YOUR SAT NAV! WHEN YOU ARRIVE AT HOLFORD PLEASE IGNORE SAT NAV! At The Plough Inn Sat Nav will direct you off the main road to the right down Portway (narrow lane not suitable for large vehicles caravans etc). Please ignore and stay on the main road. Once you leave the 30 mile area into 50 mile area there is a brown tourist sign on your left for Moorhouse campsite which is 300 yards ahead on the right. At the sharp left hand bend turn right signed Lilstock and Stogursey, Moorhouse is the first entrance on your right. We welcome dogs with responsible owners, but we do not allow dogs to be left on site unattended - it is distressing for the dog and also distressing for vistors on the site, so if you are going out for the day please take your dog with you. PLEASE MAKE SURE YOU CLEAN UP AFTER YOUR DOG - BINS ARE PROVIDED - THANK YOU. NEW WEBSITE ARRIVING SOON - watch this space! 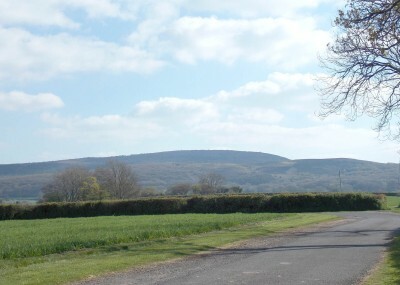 The camping field - views towards the Quantock Hills. The BBQ shelter has lighting and fridges for your use. Herbs are planted - help yourself. 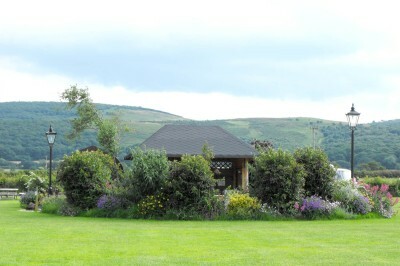 The camping and picnic area, has its own toilet block and washing up room. 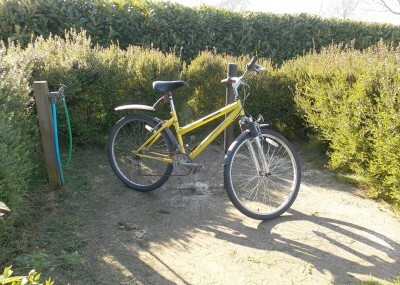 There is also a bike washing area for your use. 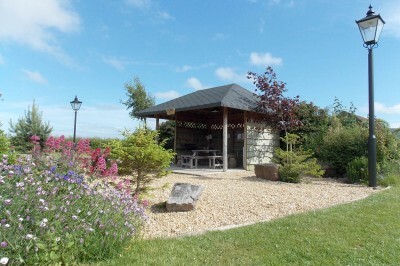 The Picnic area with BBQ Pavillion and fridge for your use. The picnic/BBQ area with fridge for campers' use. Rosemary,sage and thyme going in the borders please help yourself. 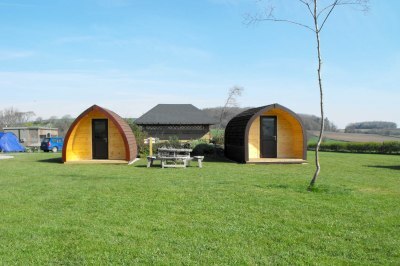 We now have our first two Camping cabin Pods on site - "Woodlands" and "Shervage." These are eco-friendly are fully insulated, 3/4 berth, with electric, heating, lighting, microwave, kettle chill-box and storage. You will need to bring with you what you would normally take camping e.g. bedding, sleeping bags, cutlery, crockery etc. Each cabin is lockable and has its own veranda with exterior lights. 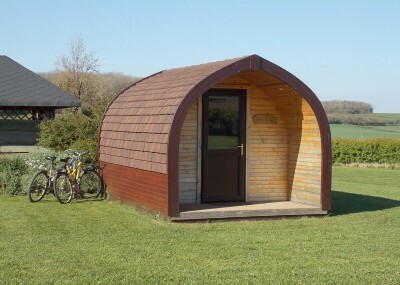 and "Shervage" (slightly larger) at £45.00 per night. Thank you for the warm welcome and wonderful campsite. 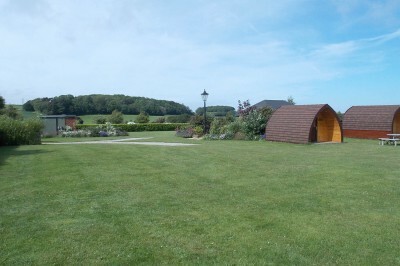 The pod is clean comfortable and will be recommending a stay at moorhouse farm from now on. Your BBQ and fire pit area is a lovely addition to the camping experience. We"ll defiantly be booking another stay soon. PS The mountain bike trail that begins just the other side of the pub, really is one of the best in the country! 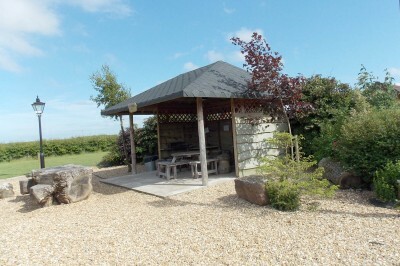 A fully refurbished Shepherd's Hut " Triscombe" with kitchen area, double bed (bedding supplied), electric. Email or call us for more details and availability. This year we spent a lovely Easter weekend at Moorhouse Campsite in a wooden pod. Normally we camp but due to the chilly weather we chickened out. On arrival we were greeted and shown to the pod. We were the first customers of this new way of camping so everyone was interested and came to have a look. We had seen and read about them on the internet but were equally curious. First impressions for us was how bright, spacious and WARM it was compared to our tent. And it had electricity, lights, two cupboards, underbunk storage, kettle, microwave and a fan heater. Absolute luxury for campers! Despite it being chilly we hardly used the latter. Also it had a useful veranda or open porch on the front which we left our shoes, wellies, our fold up table and chairs. 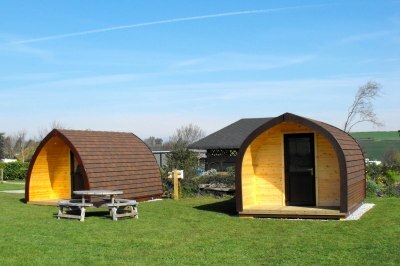 Fellow campers and caravanners were impressed especially of the warmth on entering, these pods are insulated and are warm. 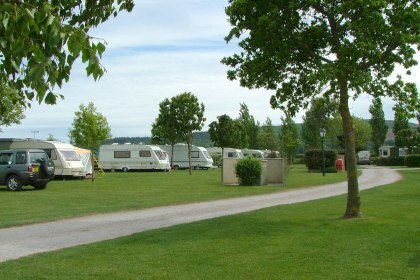 The campsite was lovely, very spacious and on flat even ground with hills in the background. The loos and showers were fairly central and easy to get to. There is an out door bbq patio area with a shelter that has a communal fridge and is enclosed by banks of herbs(labelled) which you could use. 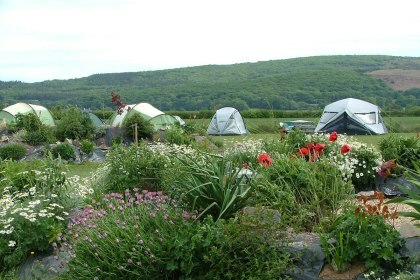 The campsite is on a farm and there are chickens and peacocks waddling freely around, a field and a track for dog walks. 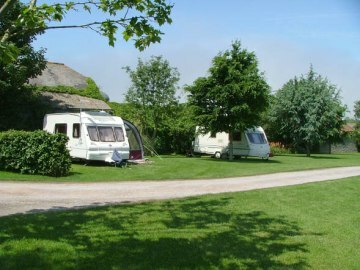 The owners Jane and Terry are very friendly and helpful and work hard to keep the campsite spotless of which it is. 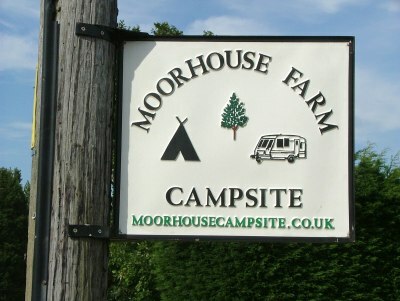 So if you want to try camping in a more comfortable and warm way, on a clean friendly site in the beautiful Quantocks then book a pod at Moorhouse! 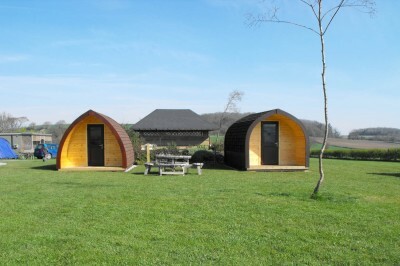 Our first holiday pods "Woodlands" and "Shervage"
Each Pod has its own veranda and parking space to the side. 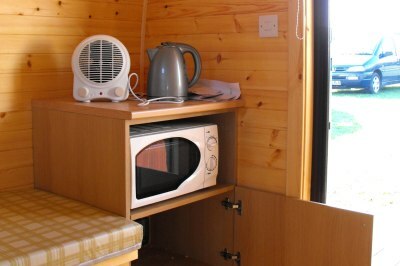 Both Pods are lockable and have storage, lighting, microwave, kettle ahd fan heater. 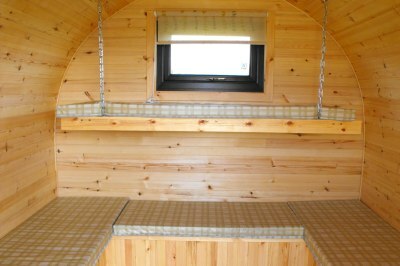 Both pods are fully insulated, sleeps 3/4, with interior and exterior lighting. 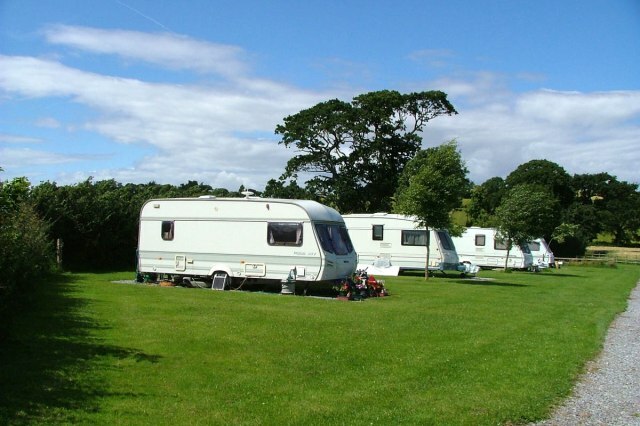 All caravans are in secure, insured and alarmed storage. 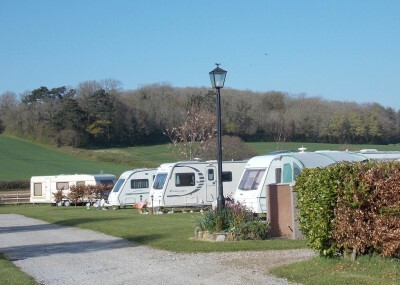 New Customers to storage - please note that as from January 2012 we will only take into storage caravans younger than 1994. PLEASE GIVE US 24 HOURS NOTICE IF YOU WANT YOUR VAN BROUGHT OUT FROM STORAGE. THANK YOU. 'The Quantocks' have the best mountain biking rides in the country. Take a look at singletrack world.com or MTBritain.co.uk and read their forums. 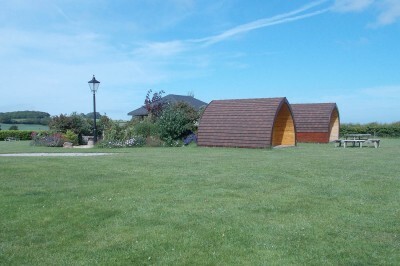 Visit us and see for yourself - our Holiday Pods are proving very popular. See Holiday Pods page for fees. 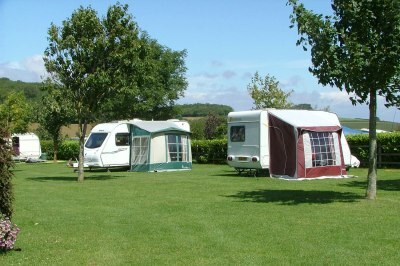 See Fees page for tent and caravan pitch fees. Just a quick note of thanks, once again, for the great facilities that your campsite offers to us campers and keen mountain bikers! We had another excellent week, helped by the best weather of course, but your friendly smile and welcome is always a great start to any visit. As your website suggests, the Quantock trails really are some of the best in the UK. 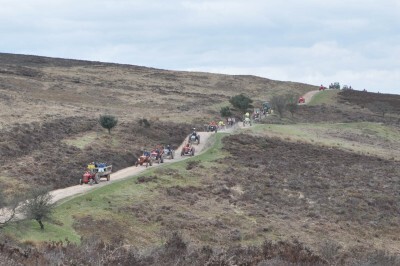 Exmoor also offers some fantastic riding. We ride all over the country and your local trails have an element of magic and are a magnet drawing us back year on year. We can't wait to come back again next year, but maybe we'll visit your new site once you are up and running - you'll need to remind me of the name again though as I have a shocking memory!! I know you said it was somewhere near Triscombe Stone. We had our fingers crossed for good weather yesterday for your Big Cream Tea and hope it was a success? We have installed a free of charge bike wash for your use. 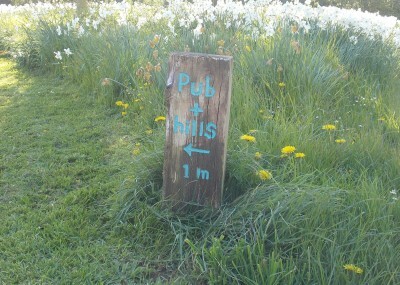 The mountain bike trail that begins just the other side of the pub, really is one of the best in the country! There are two local pubs close by serving good food. If you have any information about Mountain Biking on the Quantocks that you would like to share with other riders please let us know and we will try and include in on this Notice Board. 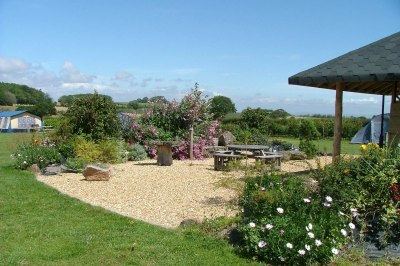 BBQ area, with picnic tables, lighting, fridges and a variety of herbs growing for your use. 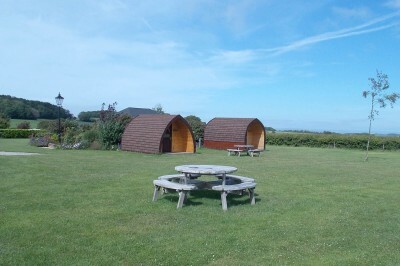 Our two Holiday Pods, Woodlands and Servage, facing the Quantock Hills. 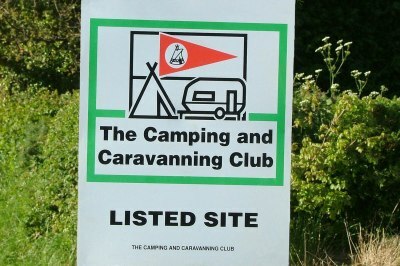 Own camping field available for caravans and tents, heated shower and toilet block away from the main site. 4 miles from Hinkley Point. raised £878.00 for the Marion Evered Trust - who support the children's cancer ward at Musgrove Park Hospital, Taunton. Thank you to everyone who helped, supported and attended on the day - see you all next year! A fully refurbished Shepherd's Hut "Triscombe"
We are told by our visitors that The Quantocks have the best mountain bike rides in the country. Mountain Bikers - we have now installed a free of charge bike washing area on site. the Vale and Hills of West Somerset. Or just come along to see the tractors and exhibits. Entry fee £10.00 per tractor. If you are a regular visitor to Moorhouse and have any information that you would like to share with other visitors, let us know, we will try and include it on our notice board. The picnic/BBQ area with picnic tables and a fridge for your use. 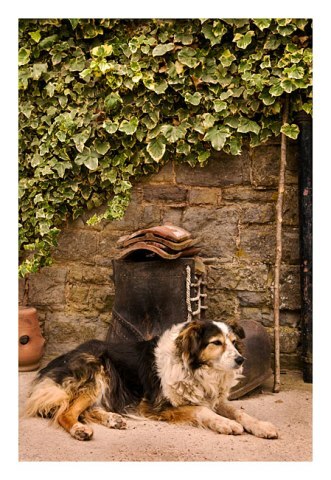 Pepsi the farm collie - a faithful friend sadly no longer with us. 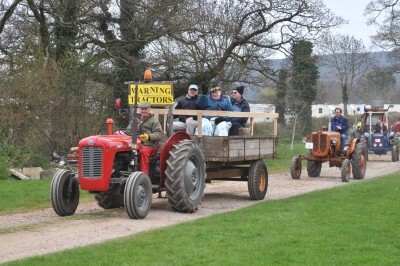 The Tractor Run 2013 - on their way back to Moorhouse, driving across the Quantock Hills at Crowcombe. This event raised over £4,300 for the Marion Evered Trust Fund. There is an open top-bus which you can take from Minehead train station across Exmoor to Lynton. Bridgwater Bay NNR contains one of the biggest intertidal mudflats in Britain and the largest area of salt -marsh in Somerset. Around 200 bird species have been recorded at the reserve and flocks of up to several thousand birds can be spotted at the busiest times of year. The reed beds support numerous small birds such as reed and sedge warbler and skylark which nest on the adjacent common land. At low tide oystercatcher and turnstone feed on exposed shingle. Many birds of prey including short-eared owl, harriers and peregrine hunt over the peninsula. The remains of a submerged fossil forest between Stolford and Hinkley indicates that sea levels here have risen dramatically since the last ice age. Tidal conditions have made the area an important fishing ground for hundreds of years. The remains of at least 76 historic fish weirs and traps have been found within the reserve. Fixed-net fishing has been carried out at the Stolford for many generations, now a much reduced industry with only a handful of licences to fish in this way are issued each year. The vast majority of the reserve is intertidal, the mudflats can be extremely dangerous. Please follow the safety recommendations highlighted on the signs throughout the reserve. The reserve will be fully open in Autumn 2014. 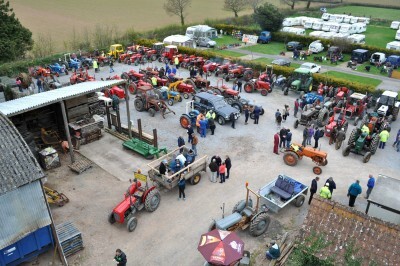 The start of the 2013 Tractor Run - leaving Moorhouse Campsite. Many thanks to all those who helped and took part. 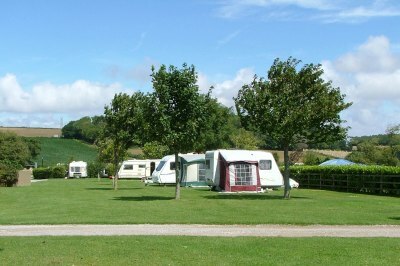 Have just had a fantastic stay at Moorhouse campsite, Holford, Somerset - what a wonderful site! Quiet and in a wonderful location, what a find - have already booked my next visit! What a lovely site, quiet, peaceful with lovely views of the Quantock Hills and surrounding area. Moorhouse was recommended to us by friends who had visited the site on many occasions, so as the weather had improved we decided to visit. We spent a week at the end of August 2008 and had a lovely stay. 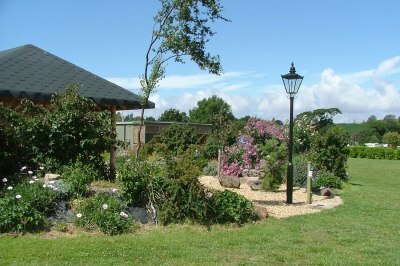 The site is immaculate, and really well looked after. The Toilet and shower block was always clean (I didn't see any spiders! )and the laundry room really useful. Pitches were really generous and well space out with plenty of room to sit out and enjoy a glass of wine in the evening. We spoke to campers on site who had been visiting this site for years, so that's the best recommendation you could have. Dogs were welcome provided they were kept under control and there is a really good 'dog walk' around the farm. There is a shop at Kilve nearby and numerous shops and a Post office at Nether Stowey. I would recommend the Plough at Holford for a good pub meal. If you enjoy walking or cycling, or just want a quiet relaxing stay in beautiful countryside this is a good site to visit and I would gladly recommend it. We booked in at Moorhouse as an overnight stop enroute to Devon - and wished we'd stayed longer! 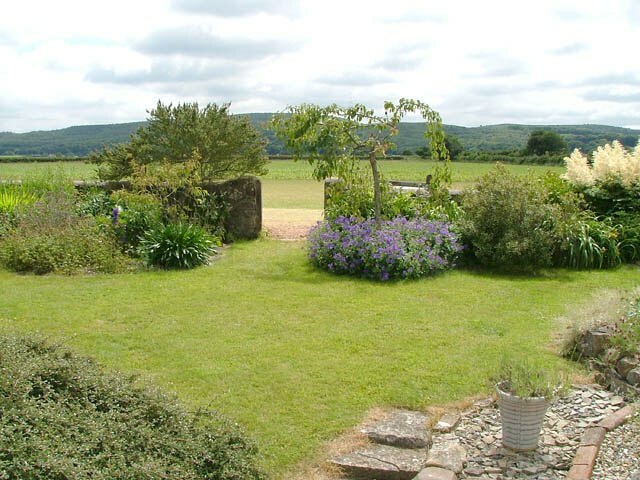 Beautiful views of the Quantock Hills and surrounding countryside, immaculately tended grass pitches and flower beds. There are even herbs you can pick to use for your BBQ! The toilet and shower blocks are simple yet very clean and nothing is too much trouble for the owners who are always on hand. There is no play equipment for children, but there is a huge field for them to run around and play in and the site itself felt very safe for my six and two year olds. 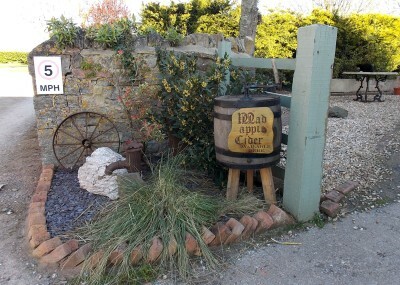 The local pub, The Plough, serves great, home cooked food with a lovely beer garden and welcoming staff. If it's peace and quiet with beautiful scenery you're looking for, look no further Just spent 8 wonderful days. Lovely camping field, hookups if you need them. Tents quite tightly packed together over Bank Holiday weekend, but lovely and peaceful for the rest of the week. Facilities good, although you need 50p for the showers. The communal fridge is a great bonus. Really good shop in Kilve (1 mile) and nice pub with great garden. Kilve beach, (small road by the shop) is very rocky but there are nice walks and picnic areas on the headland. (Dogs allowed) Lots of places to visit, Dunster with it`s castle, Minehead if you`re looking for a sandy beach(no dogs allowed)and great walking and views up on the Quantocks. 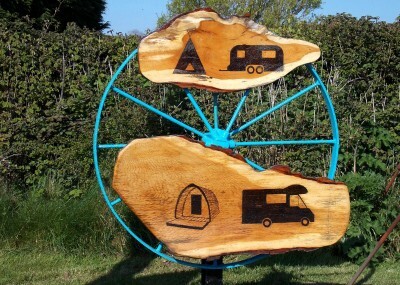 We really love this site and it is very good value, we have a caravan, but the camping section is very good, with an under cover barbecue area with a fridge, there is also a bike wash, they even have herbs growing round the camping area for use. Found this campsite by chance, a last minute long weekend for the late spring bank holiday - and very glad we did! A very warm welcome from the owner on arrival who was really helpful in getting us set up. The toilets and shower block were clean and modern. The site itself was very clean and tidy. 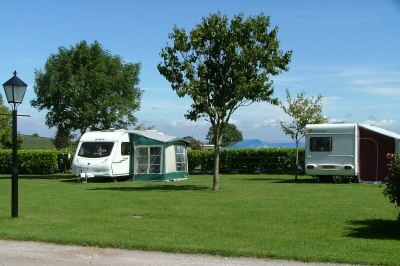 The grass was well maintained and pitches were generous and well laid out - separated by hedges and trees. There were plenty of recycling bins located across the site. The price for a serviced pitch was excellent - even with the additional 50p required for the showers this was such good value. 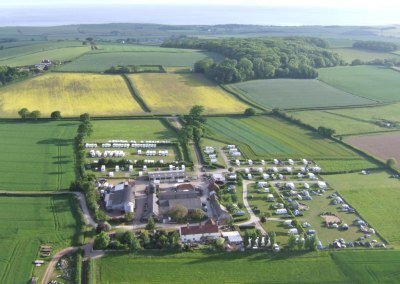 We've been camping for 35 years now and this has to be one of the best campsites we've stayed at in the UK. High praise I know, but I say that because the site is modeled on continental sites with well above average space between pitches and trees, hedges or shrubs dividing each individual pitch giving lots of privacy. The tent field is definitely the best we've seen. It's flat with a great central communal BBQ area which is covered should it rain and has good quality BBQ's with lots of wooden tables and seats. We've experienced this arrangment in the Netherlands where people gather in the evenings to socialise. It's a great idea for backpackers or couples with small tents. 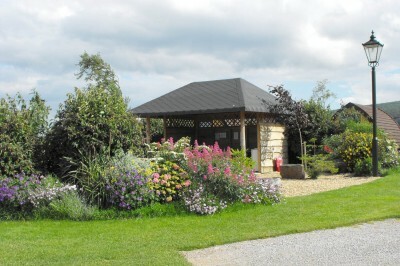 The whole campsite is peaceful, very pretty and well looked after with borders of flowering schrubs. The owners couldn't be more friendly and helpful giving us plenty of information about the local pubs which are really friendly with good food and a great selection of local cidars, shops etc. And all the fantastic walks from the campsite up onto the Quantock Hills. The facilities are more than adequate with two toilet blocks, showers, dishwashing areas and a separate laundry room with washing machine and tumble drier and clothes drying area just outside. All are kept spotlessly clean. The charge was £18 per night for a caravan and two adults with dog. The charge for electricity was a £2 token which usually lasted us 2 or 3 days depending on usage and when it runs out you just buy another token. So much cheaper than other sites which can charge up to £5 a day for electricity, and which we now realise is a real rip-off! This site is no longer a working farm but the owners keep freerange hens (selling the eggs from the farmhouse), doves and even a peacock. We'd intended staying here for only two nights and then moving on, but loved it so much that we ended up staying for ten nights. I highly recommend this site and just wish we didn't live so far away from it (Scotland) or we'd stay more often. I also wish more campsites in the UK were like this, instead of the usual featureless rows of hard-standings with very little space between pitches that is found in this country. If you enjoy the countryside, peace and quiet, walking and having a really good sized grass pitch with some privacy, then this is the site for you. Such a refreshing find! We stayed at this site for 3 nights (late May), this was our first camping for 35 years plus so we were somewhat apprehensive, we arrived to be greeted by our host who showed us to our pitch and explained everything we needed to know. 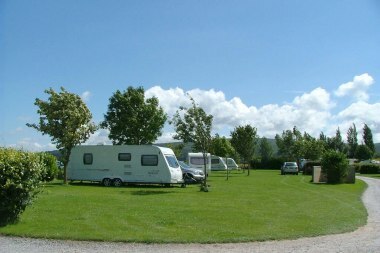 Everything we wanted was to hand and the place is kept spotlessly clean The showers are a short distance from the pitches and are well maintained and at 50p for a full five mins a real bargain. The hook up is prepaid and sold in units of £1. 00 so you use as much or as little as you like. The campsite was not overcrowded so gave you that 'getting away from it all effect' We cannot praise this site enough a real gem! 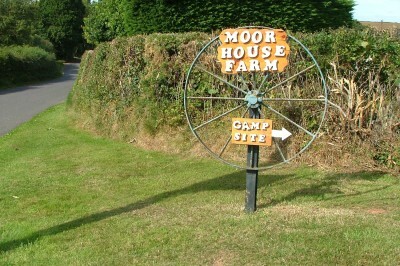 Just got back from a wonderful weekend on Moorhouse campsite. The weather wasn't great with rain showers all through, but it didn't spoil our stay as the facilities on the site were so fabulous. The local area was beautiful (even when the sun wasn't out). The owners of the site must work so hard to keep everything so well stocked and tidy. 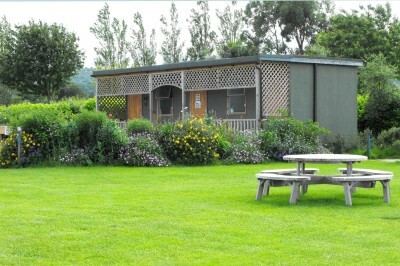 The toilets and wash up rooms were very close to our tent and always kept clean and well supplied. The wet room showers were a bit further to walk and cost 50p but again clean and lovely hot water. There was a sheltered area on our field where you could bbq and have fires which was great as it would've been a bit wet and windy by our tent. It was also a good place to meet the other campers and have a chat around the fire in the evening. 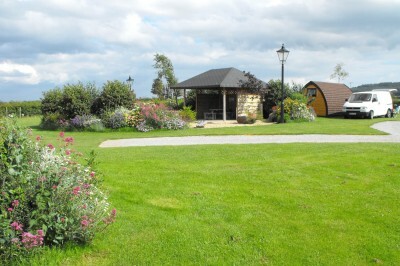 The whole campsite was planted beautifully to give picturesque surroundings. I am usually a very fussy camper but I think I smiled all weekend :) By far THE best site we've stayed on and will be booking there again - feel like we've discovered a really well kept secret! <?xml:namespace prefix = o ns = "urn:schemas-microsoft-com:office:office" /> I stayed at this campsite for 3 nights from 9th July, it was my second successive year camping here, and it’s been fantastic both times. For what I want from a campsite this place is brilliant. It is lovely and quiet, in a beautiful setting, at the head of numerous mountain bike trials. 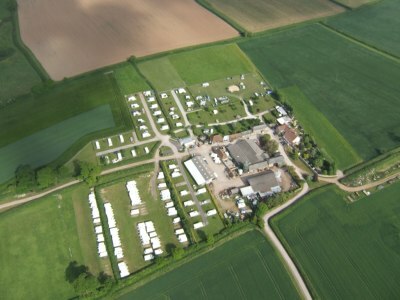 The site has separate fields for tents, visiting caravans and permanent pitches, with clean toilet blocks, showers, laundry and washing up kitchens. 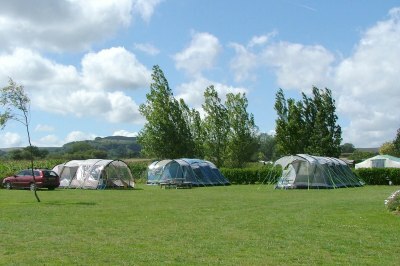 The camping field also has in the centre a covered area containing a fridge as well as fire pit and BBQ for campers’ use. There are electrical hook up’s in the tent field, as well as 2 Camping pods for those travelling light or want a little extra protection from the elements. If you want a club house or playground, this isn’t for you, but if you want to watch the swallow’s swoop over the meadows during the day, and the bats flick inches above your head whilst listening to the tawny owls hoot in the nearby woods this is the venue for you. The owners are very friendly, with Jane making regular rounds, greeting her guests, and her husband tending to the grounds, both always happy for a chat, and full of useful local information. New for us this year was the scrumpy cider made from apples harvested from the farm’s orchard and “brewed” on site, by Mad Apple Cider. Delicious, but traditionally potent! Thanks for a great weekend at Moorhouse. Everyone enjoyed themselves and appreciated all the hard work you put in to making the site so welcoming and comfortable. I could not find how to put a review on your website so hope you will upload this one. We are so grateful to you for giving us a restful two days on your site despite our late arrival due to a breakdown. Thank you for your warm welcome and the really clean and tidy site. 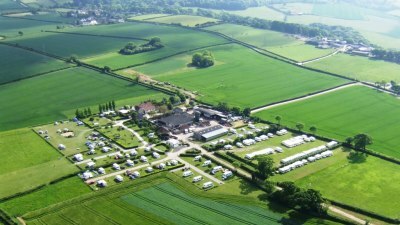 We generally don’t like larger campsites preferring CL site (only five caravans) but will have to make an exception with this one! I think the layout in small group areas made it seem much smaller than it was. We have to admit the hard standing was reassuring with a motorhome in the rain we have had recently. Enjoyed a 5 night stay in August. We had actually booked another site but they had to cancel our booking so we ended up at Moorhouse Farm and were very glad we did. Nothing to fault, level pitches, plenty of space, beautifully cared for, with shrubs, rockeries, etc and the herb garden a nice touch. 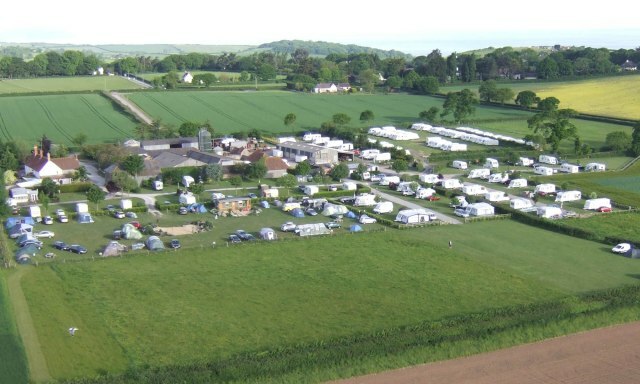 Site not over busy during our stay, although you don't feel it is busy as it is so well set out with areas separated by trees, hedges so you are not really aware of other caravans and tents. Two fridges provided meant we could forget about icepacks etc. BBQ area, toilets spotless, only 3 showers but never a queue. Owners very friendly and helpful and regularly out and about. It's the first time since we've got back to be able to contact you, Despite the elements being against us we have had a fantastic time at Moorhouse Farm, you really are a very special couple who take an absolute pride in everything you do to make holidays what they should be, a relaxing and pleasant time. You came to us on recommendation and we will most certainly be passing on the recommendation to others we know who enjoy the camping lifestyle. Once again thank you for making our first holiday of the 2012 season a very memorable one, on what has to be the best kept campsite we have ever stayed at. The West & Nazrali Famillies. to the sea at West Quantoxhead. 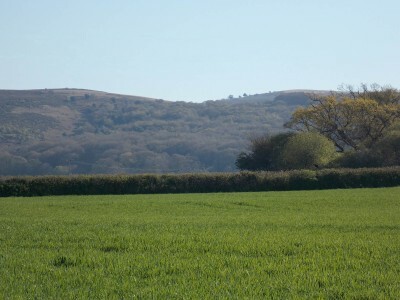 This is ideal walking country with far reaching views across 9 counties and over the Bristol Channel to Wales. With its many criss-crossed footpaths, bridleways and steep wooded combes it is also a very popular area for mountain bikers. to explore the Hills from. site for groups – schools, colleges, universities, Duke of Edinburgh groups etc. Directions to Moorhouse Farm are fairly straight forward. 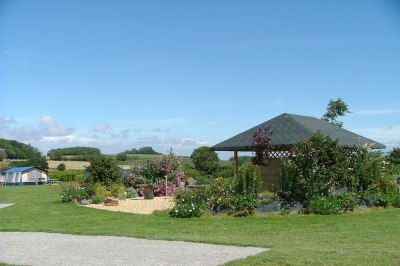 We are about 10 miles west of Bridgwater just off the A39. Come off the M5 at junction 23 for Bridgwater (signed Bridgwater, <?xml:namespace prefix = st1 />Glastonbury, Street). Follow signs for Bridgwater along dual carriage way then follow signs for Minehead on A39, by-passing town centre. Stay on A39 by-passing Cannington. Past Village of Nether Stowey (on your left), heading towards Holford. At Holford, The Plough Inn is on your left. PLEASE IGNORE SAT NAV! 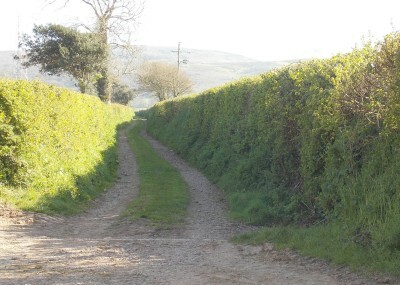 Sat nav will direct you off the main road down Portway (narrow lane not suitabe for large vehicles caravans etc). Stay on the main road. Once you leave the 30 mile area into 50 mile area there is a brown tourist sign on your left for Moorhouse campsite 300 yards ahead on your right. At the sharp left hand bend there is a road off to the right signed Lilstock and Stogursey, turn off here and Moorhouse is the first entrance on your right.